Suitable for all handlebars!! Whether open or closed. Protect hands from the cold when using the pushchair. Use them instead of your winter gloves or on top of them as extra protection for the coldest season of the year. Unisex colour. Designed for adult use. 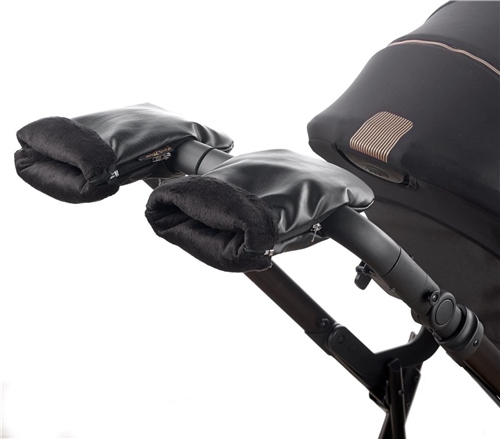 Quick and easy to fit onto the handlebar of your pushchair. You can take your hands out quickly if you need to. Suitable for use with the pushchairs with 2 handles (open umbrella type handlebars) or just one handle (closed handlebar). For greater convenience, you can fully open the mitts using the side zips when putting them on. You can also shorten the wrist part by simply folding it over. Composition: 50% polyester – 50% Polyamide. Good mitts which fit on pushchair well and keep hands dry & warm. But rather expensive.